KDKA in Pittsburgh has released new footage of the now infamous kick that everyone is still talking about from Thursday night in Baltimore. In the video, you can see Mike Tomlin stepping towards the field before having to jump out of the way at the last second before he got run over by Jacoby Jones. Tomlin today defended the incident again, telling Jay Glazer of Fox Sports that there’s no way that he tried to interfere on purpose. 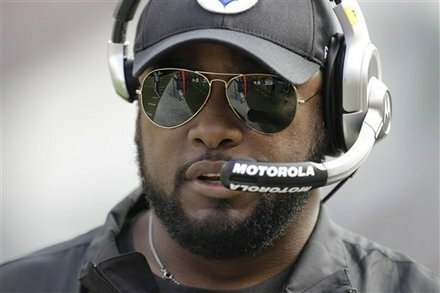 As of 6:30pm Monday night, the NFL hasn’t handed down any sort of punishment against the Steelers coach. 3 Comments on "New Video Shows Tomlin Side Stepping Towards Field Thursday"
I wish Tomlin would concentrate on getting the team prepared for game day instead of letting the team look pathetic. Embarrassing to see a head coach act like a joker on the sideline. He did step onto the field and later snickers about it. Come On Man! Show some class! I agree Mario…classless act and not Steeler like. Will be surprised if he is not fired over this. This rivals Patriots stealing video from teams and then saying that they never did it. I have to say, I did not expect to see this sort of response in Pittsburgh. Thank you both. This is one of the best rivalries in the NFL – hands down. Our matches are always some of the best the season has to offer. There is definitely some NFL “hatin'” going on between these two towns, but one thing is for sure, we respect each other. We respect each other because these two teams are founded on defense, are committed to excellence in both organizations, and arrive to win. I was at the stadium Thursday sitting with the same people I always sit with, and we were all shocked. We all respected the leader of the Steelers, but he lost something on Thanksgiving night.